Finished the proposal for "Five Sisters" yesterday. I'll go ahead and post the introduction page here to give you a better idea of that film. Now I still need to polish up the proposal for "All Well and Fair". Looks like that'll have to wait until we're in Florida. We're heading on our next trip tomorrow. It'll be a combination of more filming for "Five Sisters" (maybe even "All Well and Fair"), some holiday R&R with Scott's family and hopefully the completion of our website overhaul. 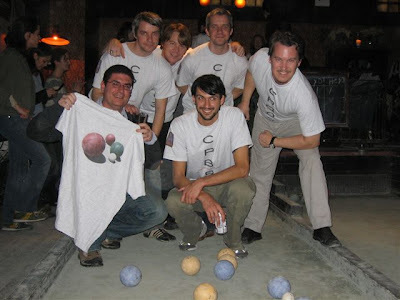 In equally exciting news the bocce team The Reels (Scott, Jeff & James from Back and Forth Films, photographer Jamie and architects Dan and LJ) placed third at Union Hall Fall 2006 Bocce Tournament. CONGRATULATIONS!